To make this monster truck cake, I made one 13" X 9" cake, and two round 8" cakes. I cut the truck body from the large cake, and used the two round cakes for tires. I spread blue icing on with an offset metal spatula. I used Oreo baking crumbs for "dirt" on the tires. 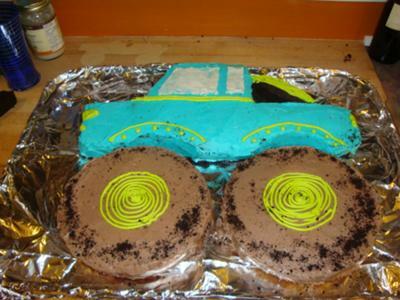 Loved your monster truck cake. I needed a smaller version of this cake and used donuts for the wheels. Turned out really well. Thanks for the inspiration! Oh, that's just too cute! I bet he did love it!!!!!! Thanks Nancy for your kind words! The look on my little boy's face was priceless! Words of advice for anyone wanting to do a special cake - just go for it! You can do it!